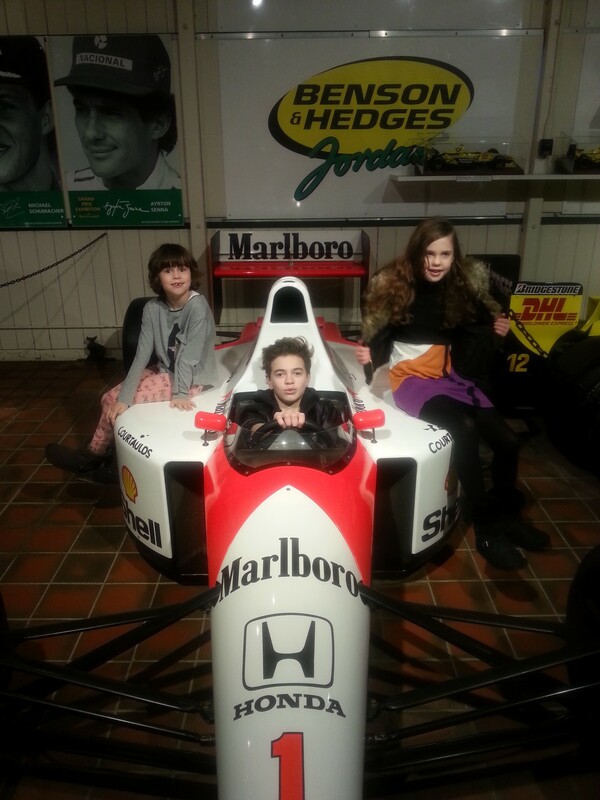 Early in the New Year when the UK was under a deluge of torrential rain and the kids were going slightly loopy after being cooped up in the house, we all decided to go to Brooklands Museum on the recommendation of a friend. I had never heard of Brooklands before, but I should have, as it was the birth place of British Motor-racing and its evolution into the modern equivalent: Formula One. As well as the circuit an aerodrome/airfield was built on the site and rose to become one of the UK’s largest aircraft manufacturing centres by 1918. Geographically it’s located right next door to Mercedes-Benz World in Weybridge, Surrey. It will certainly appeal to those with an interest in motor-racing and aviation. 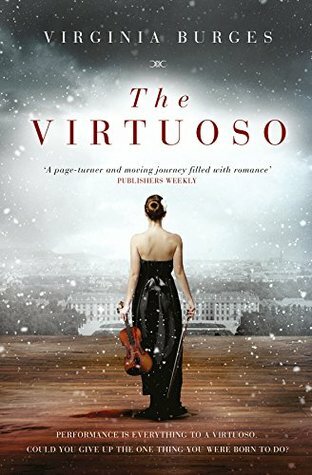 Even my daughters (aged 8 and 6) really enjoyed it. For me it meant the chance to go aboard Concorde – albeit stationary – something I’ve always wanted to do but after they were taken out of service in the aftermath of the tragic Air France accident I thought I’d never have the chance. Having worked for Qantas for eight years and in the travel side of F1 it was a no brainer for me! We started our exploration in the R.R. 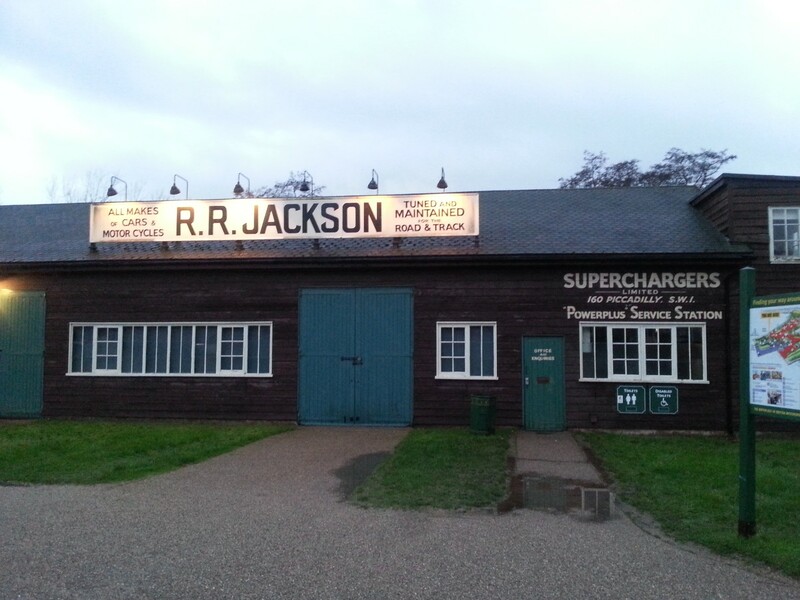 Jackson hut which takes you back to the early years of Formula One with cars from each era as well as memorabilia and information relevant to the sport at the time. 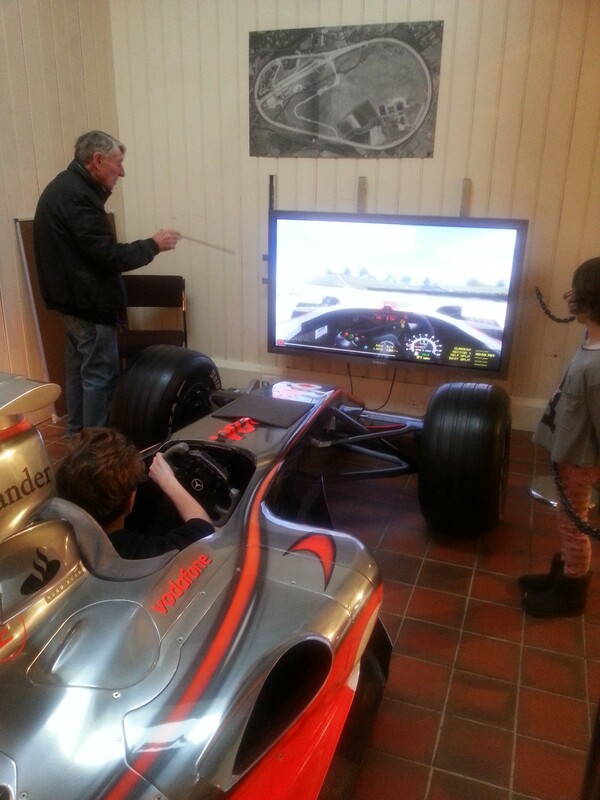 Having a teenage son of course, meant that he made a beeline for the F1 Simulator tucked away in the corner. He looked right at home in Lewis Hamilton’s 2008 McLaren show car! He soon got used to the steering wheel and the handling and did a very respectable lap of Brooklands at 217 KPH. 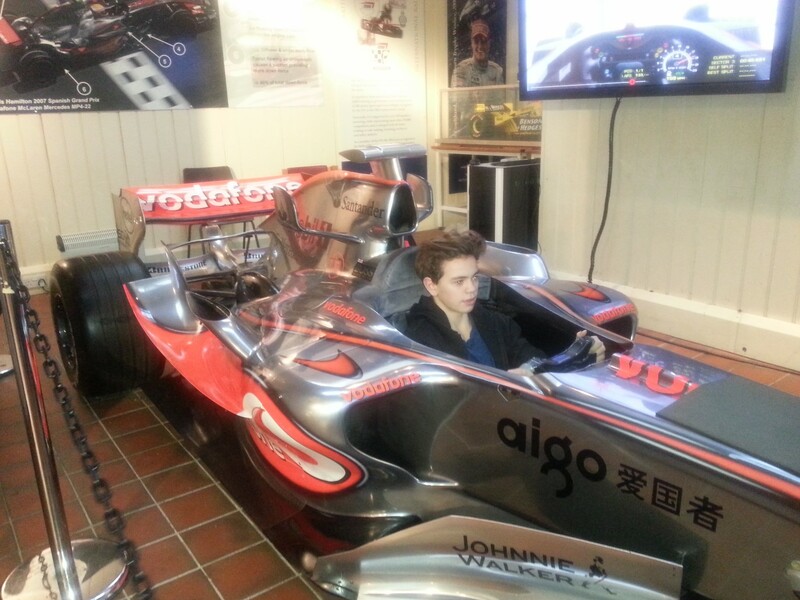 Wills enjoying the F1 simulator in Lewis Hamilton’s 2008 McLaren show car. There’s also Senna’s 1992 Honda F1 show car, which the museum allows people to sit in. It was quite emotional to see his car right in front of us. I grew up watching Ayrton Senna racing on the TV, alongside his arch rivals Prost and Mansell. There are other huts for motor-racing related exhibits, but as we were short on time I took Will to the airplane hangar. They had many wonderful old airplanes in there from WW1 to the Harrier Jump Jet and a Wellington bomber that had been salvaged from the murky depths of Loch Lomond in 1985 after it had crashed soon after take-off during the Second World War. The crew had bailed out, but sadly the gunner’s parachute didn’t open. The whole hangar was filled with engines, photos, and volunteers on hand to explain about the different aircraft on display. Whatever you do, don’t push the ejector button! 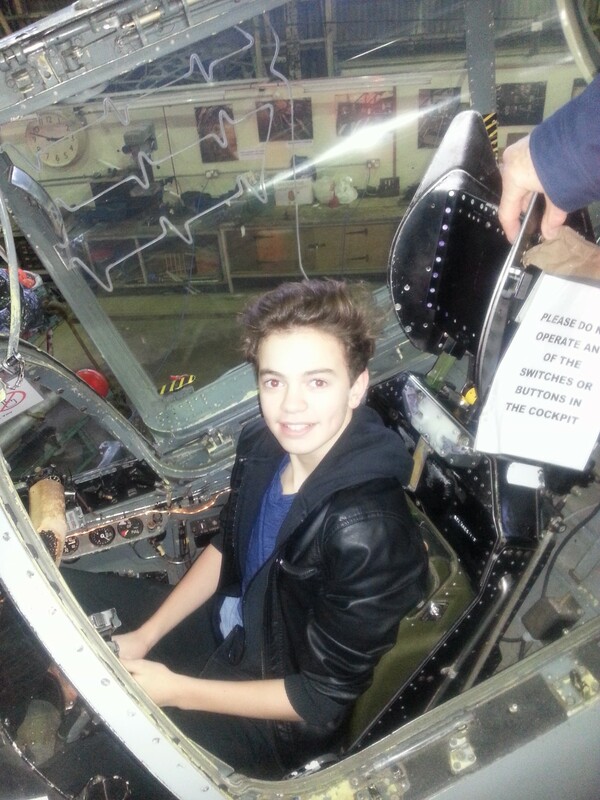 Of course I had to take the obligatory photo of Will in the Harrier. Outside they had one of the Sultan of Brunei’s planes and other various commercial jets that the girls loved exploring. There’s also a very sizeable café with a separate section for young children that serves delicious hot food, pastries and snacks. “While the US aimed for the moon, Britain aimed for supersonic flight – and we made it too.” ~ Reginald Turnhill (former BBC Aerospace & Defence Correspondant). 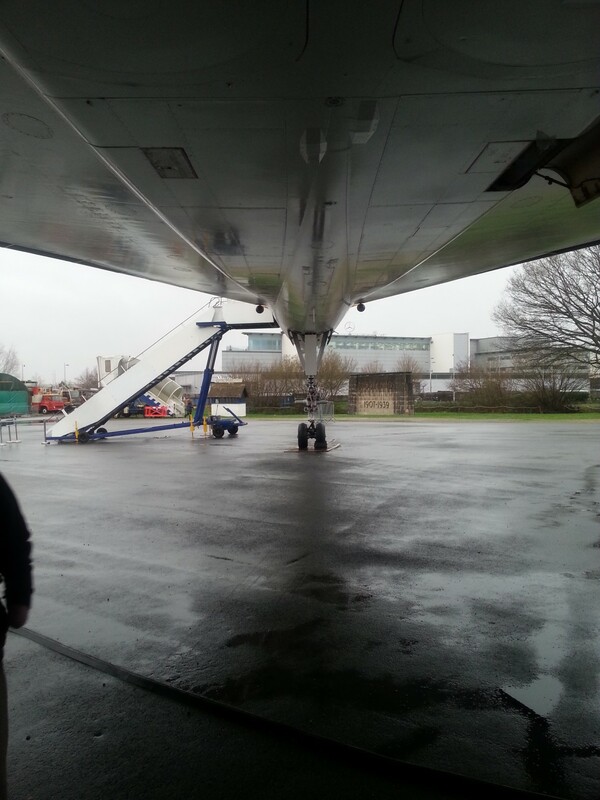 I started my education underneath Concorde’s belly. A very knowledgeable character with an engineering background explained about her design, the engines, landing gears, air intake etc. I’m only sorry that I can’t do justice to his amazing talk. I do remember him saying that Concorde took-off at an incline of fifteen degrees, reaching a speed of 220 kt compared to 165 kt for most subsonic aircraft. 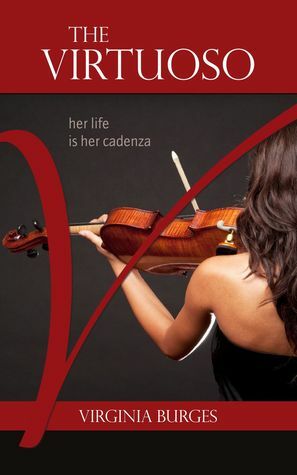 In other respects it performed in much the same way. 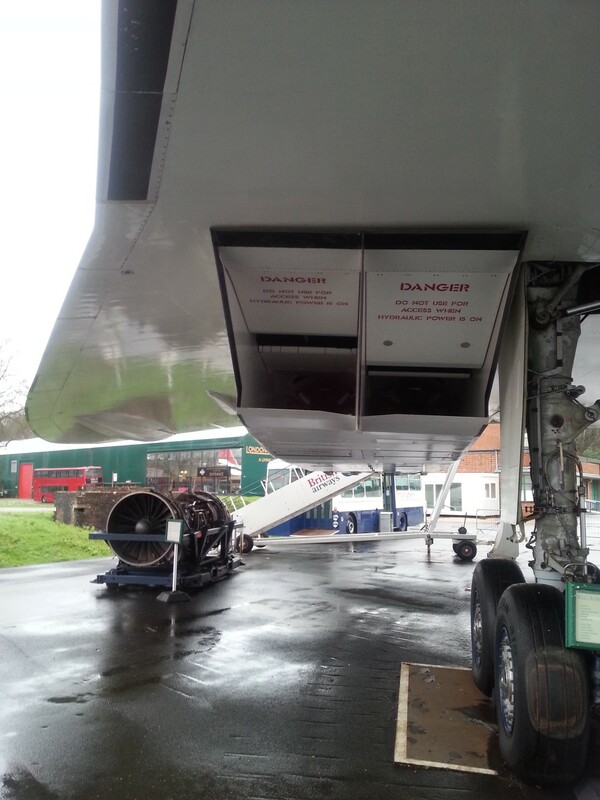 Our guide explained that on take-off Concorde required 25% more engine power and this was applied for one minute and fourteen seconds exactly and then the after-burners were switched off for noise abatement and to conserve fuel. Normally over south Wales they opened up the four Rolls Royce Olympus engines again to reach the speed of sound – Mach 1, at 670mph. 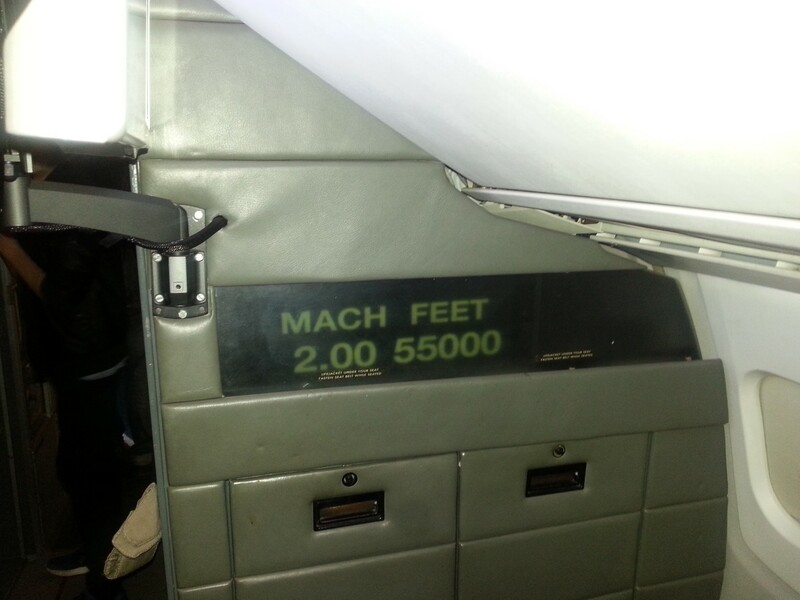 The term ‘Mach’ is named after Austrian physicist Ernst Mach and used to describe the speed of an aircraft as a ration of the speed of sound, with Mach 1 being the point after which the aircraft is ‘supersonic’. When Concorde has reached her cruising altitude of between 55-60 thousand feet, and a speed of 1350 mph she will be travelling at twice the speed of sound – Mach 2. This is a dangerous speed as the engines can’t handle the extra air speed so Concorde was fitted with special air intake chambers, around eleven feet long containing computer operated angled slants which slowed down and spread the air so as not to damage the engines. Around a ton of aviation fuel is burnt up on take-off, and at this point another nine tonnes of fuel is stored in the aircraft to make it across the Atlantic travelling at Mach 2. The morning flight took just over three hours, cruising at around 60,000 feet where the curvature of the earth is visible, and because Concorde flew faster than the earth rotated, passengers arrived to witness the sunrise in New York! 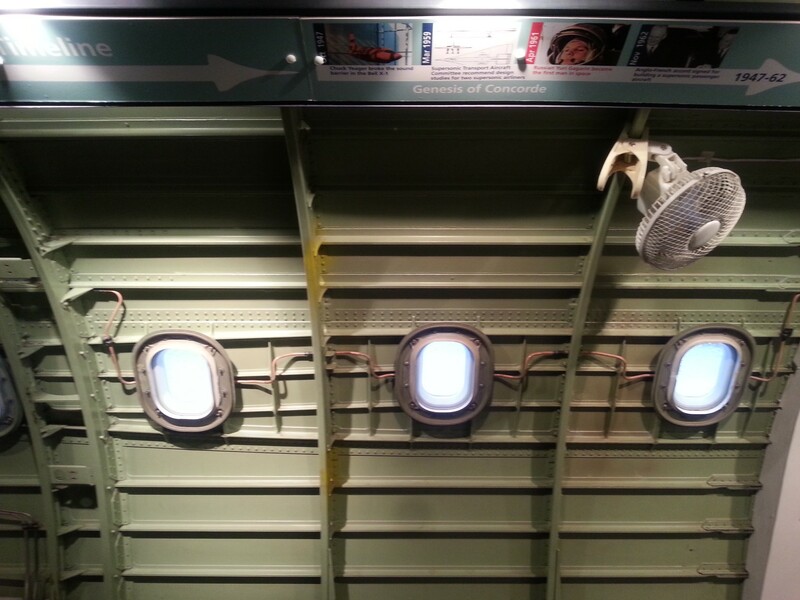 When we went on board there was a great display that detailed the history of the aircraft. ‘Delta Golf’ as she’s affectionately known, was the first Concorde to fly supersonic with 100 passengers on board in 1974. 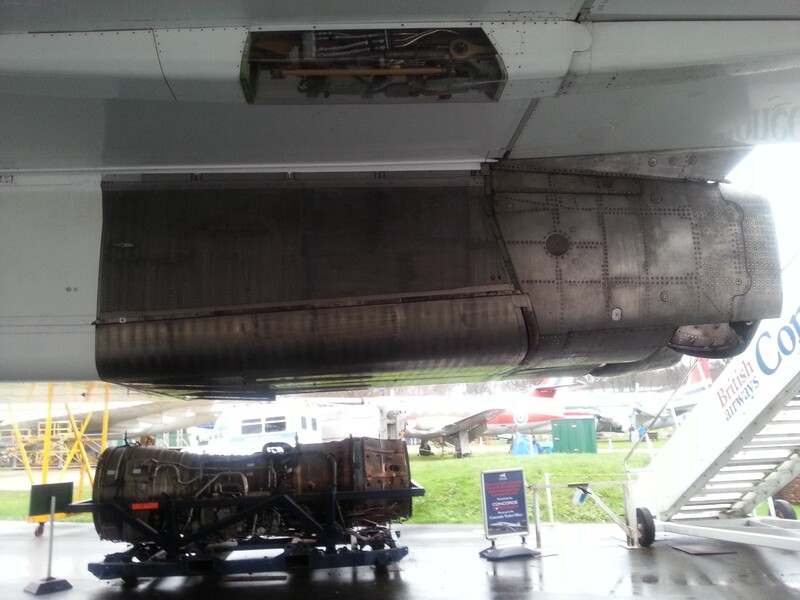 Part of the internal fuselage was left uncovered so that you could see the cooling system inside the cabin to keep passengers from burning themselves! What struck me was how small the windows were compared to subsonic aircraft, in case of depressurisation at high altitude. We then sat at the front in the section that had been fitted with passenger seats for an in-flight simulation, which was brilliant! In my humble opinion Concorde was one of the great machines of the twentieth century and one of the most elegant and beautiful flying machines of all time. 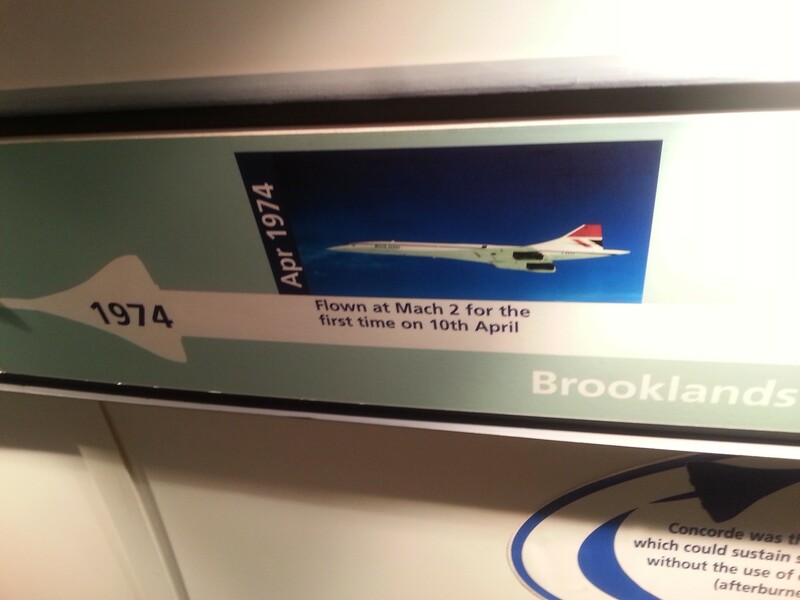 When travelling at Mach 2 (1350 mph) Concorde flew faster than a rifle bullet. The airframe expanded by as much as six to ten inches during its flight due to friction, keeping it corrosion-free. The temperature in the cabin reached 90 degrees and required its own cooling system. 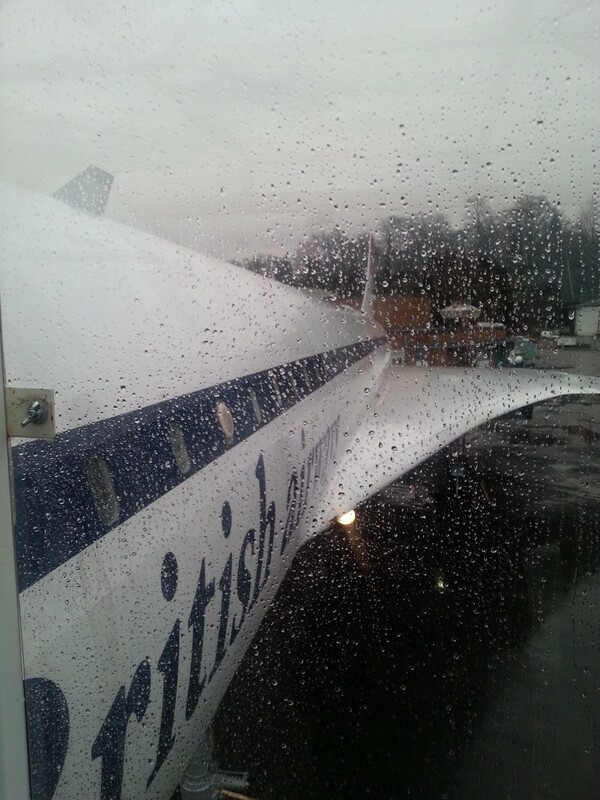 The pointed nose of Concorde reached a temperature of 127 degrees at supersonic speeds. The ‘droop’ nose was lowered to give the pilots’ visibility for take-off and landing. 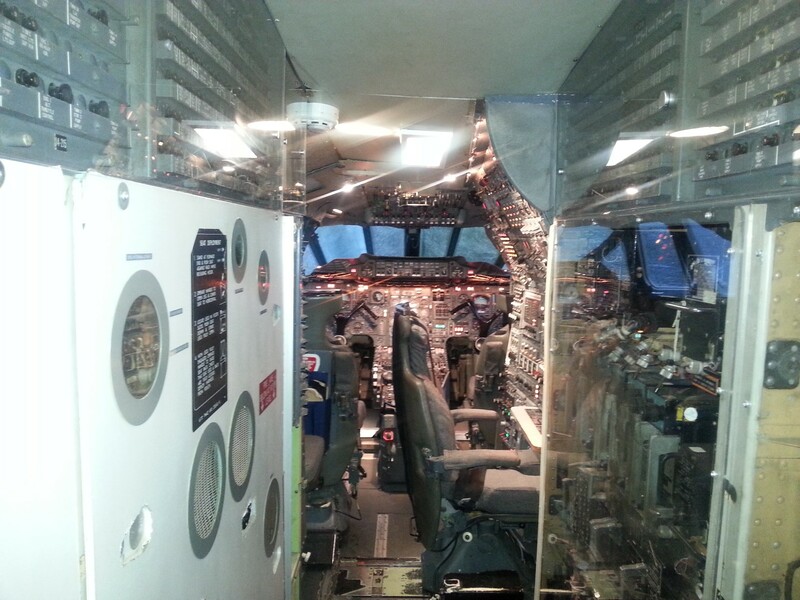 Only 20 Concordes were built, 14 of which remained in service, 7 with British Airways and 7 with Air France. The very first commercial reservation to travel on-board Concorde was taken in 1960, nine years before the first test flights. Proving the aerodynamic shape of Concorde took over 5,000 hours of subsonic, transonic and supersonic wing tunnel testing. 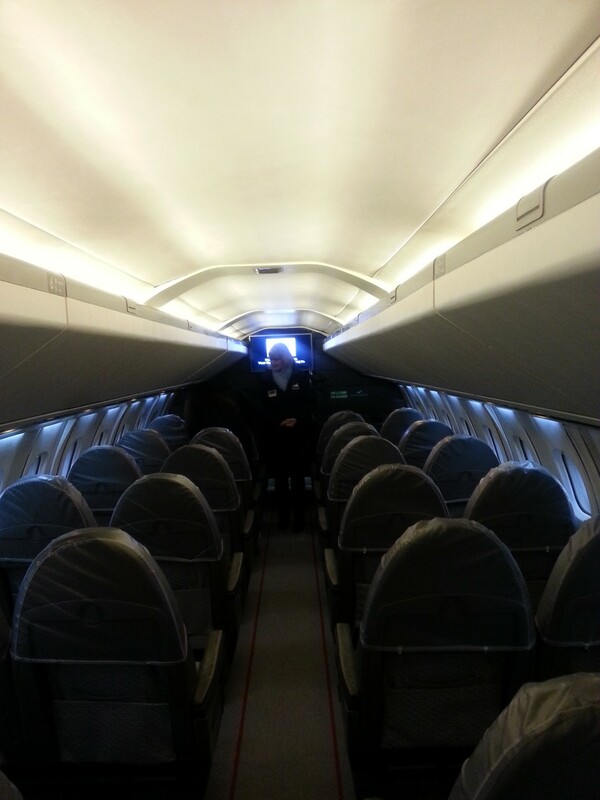 By the time Concorde was in commercial service it was the most tested aircraft in aviation history. British Airways Concorde flight stats: 50,000 flights, 140,000 flying hours, of which over 100,000 were at supersonic, covering 140 million miles. More than 2.5 million passengers flew supersonically on British Airways flights since the aircraft went into service in 1976. Phil Collins took Concorde from London to New York to appear on both sides of the Atlantic in one day for the Live Aid music event in aid of famine relief in Africa. There were more US astronauts than BA Concorde pilots! British PM Jim Callaghan was the first supersonic prime minister when he flew to Washington to meet President Jimmy Carter to negotiate landing rights for British Airways Concorde in the USA. The commercial supersonic era began on 21st January 1976, with British Airways flying from London Heathrow to Bahrain and Air France from Paris to Rio de Janeiro. Due to Concorde’s high cruising altitude (50- 60,000 ft.) and the aerodynamic properties of its delta wing, its passengers experienced only one sixth of the turbulence experienced by subsonic jet travellers. Concorde’s fastest transatlantic crossing was on 7th February 1996, when it completed the New York to London flight in two hours 52 minutes and 59 seconds. The last ever flight of Concorde was on 26th November 2003 when G-BOAF was flown to Airbus UK at Filton for retirement. In conclusion, Brooklands is well worth a visit. You could combine it with a visit to Mercedes-Benz next door, which is something I promised Wills in the future. “It’s hard to believe there will never be another supersonic aeroplane – inspired by Concorde’s achievements.” ~ Brian Trubshaw.